This topic lists a few common issues you may encounter when using Disk Management. If you get an error or something doesn't work when following these procedures - don't panic! There's a ton of info on the Microsoft community site - try searching the Files, folders, and storage section, and if you still need help, post a question there and Microsoft or other members of the community will try to help. If you have feedback on how to improve these topics, we'd love to hear from you! Just answer the Is this page helpful? prompt, and leave any comments there or in the public comments thread at the bottom of this topic. Cause: If you have a disk that doesn't appear in File Explorer and is listed in Disk Management as Not Initialized, it could be because the disk doesn't have a valid disk signature. Basically this means that the disk has never been initialized and formatted, or the drive formatting has become corrupted somehow. It's also possible that the disk is having hardware problems or issues plugging in, but we'll get to that in a few paragraphs. Solution: If the drive is brand new and just needs to be initialized, erasing any data on it, the solution is easy - see Initialize New Disks. However, there's a good chance you've already tried this, and it didn't work. Or maybe you have a disk full of important files, and you don't want to erase the disk by initializing it. There are a bunch of reasons a disk might be missing or fail to initialize, with a common reason being because the disk is failing. There's only so much you can do to fix a failing disk, but here are some steps to try to see if we can get it working again. If the disk works after one of these steps, don't bother with the next steps, just kick back, celebrate, and maybe update your backups. Look at the disk in Disk Management. If it appears Offline as shown here, try right-clicking it and selecting Online. If the disk appears in Disk Management as Online, and has a primary partition that's listed as Healthy, as shown here, that's a good sign. If the partition has a file system, but no drive letter (for example, E:), see Change a drive letter to add a drive letter manually. If it doesn't have a file system (NTFS, ReFS, FAT32, or exFAT) and you know the disk is empty, right-click the partition and select Format. Formatting a disk erases all data on it, so don't do this if you're trying to recover files from the disk - instead, skip ahead to the next step. If you have an external disk, unplug the disk, plug it back in, and then select Action > Rescan Disks. Shut down your PC, turn off your external hard disk (if it's an external disk with a power cord), and then turn your PC and the disk back on. To turn off your PC in Windows 10, select the Start button, select the Power button, and then select Shut down. Plug the disk into a different USB port that's directly on your PC (not on a hub). Sometimes USB disks don't get enough power from some ports, or have other issues with particular ports. This is especially common with USB hubs, but sometimes there are differences between ports on a PC, so try a few different ports if you have them. It might sound crazy, but cables fail a lot, so try using a different cable to plug the disk in. If you have an internal disk in a desktop PC, you'll probably need to shut your PC down before switching cables - see your PC's manual for details. Press and hold (or right-click) the Start button, then select Device Manager from the context menu. Look for any devices with an exclamation point next to it or other issues, double-click the device and then read its status. 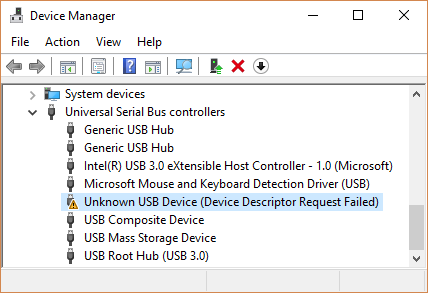 Here's a list of Error codes in Device Manager, but one approach that sometimes works is to right-click the problematic device, select Uninstall device, and then Action > Scan for hardware changes. Plug the disk into a different PC. If the disk doesn't work on another PC, it's a good sign that there's something bad going on with the disk, and not your PC. No fun, we know. There are some more steps you can try in External USB drive error "You must initialize the disk before Logical Disk Manager can access it", but it might be time to search for and ask for help at the Microsoft community site, or contact your disk manufacturer. If you just can't get it working, there are also apps that can try to recover data from a failing disk, or if the files are really important, you can pay a data recovery lab to try to recover them. If you find something that works for you, let us know in the comments section below. Disks fail pretty often, so it's important to regularly backup any files you care about. If you have a disk that sometimes doesn't appear or gives errors, consider this a reminder to double-check your backup methods. It's OK if you're a little behind - we've all been there. The best backup solution is one you use, so we encourage you to find one that works for you and stick with it. For info on how to use apps built into Windows to backup files to an external drive such as a USB drive, see Back up and restore your files. You can also save files in Microsoft OneDrive, which syncs files from your PC to the cloud. If your hard disk fails, you'll still be able to get any files you store in OneDrive from OneDrive.com. For more info, see OneDrive on your PC. Cause: The basic or dynamic disk is not accessible and might have experienced hardware failure, corruption, or I/O errors. The disk's copy of the system's disk configuration database might be corrupted. An error icon appears on disks that display the Unreadable status. Solution: Rescan the disks or restart the computer to see if the disk status changes. Also try the troubleshooting steps described in A disk's status is Not Initialized or the disk is missing entirely. Cause: The Foreign status occurs when you move a dynamic disk to the local computer from another computer PC. A warning icon appears on disks that display the Foreign status. In some cases, a disk that was previously connected to the system can display the Foreign status. Configuration data for dynamic disks is stored on all dynamic disks, so the information about which disks are owned by the system is lost when all dynamic disks fail. Solution: Add the disk to your computer's system configuration so that you can access data on the disk. To add a disk to your computer's system configuration, import the foreign disk (right-click the disk and then click Import Foreign Disks). Any existing volumes on the foreign disk become visible and accessible when you import the disk. Cause: The dynamic disk has I/O errors on a region of the disk. A warning icon appears on the dynamic disk with errors. Solution: If the I/O errors are temporary, reactivate the disk to return it to Online status. Cause: An Offline dynamic disk might be corrupted or intermittently unavailable. An error icon appears on the offline dynamic disk. If the disk status is Offline and the disk's name changes to Missing, the disk was recently available on the system but can no longer be located or identified. The missing disk may be corrupted, powered down, or disconnected. Repair any disk, controller, or cable problems. Make sure that the physical disk is turned on, plugged in, and attached to the computer. Next, use the Reactivate Disk command to bring the disk back online. Try the troubleshooting steps described in A disk's status is Not Initialized or the disk is missing entirely. If the disk status remains Offline and the disk name remains Missing, and you determine that the disk has a problem that cannot be repaired, you can remove the disk from the system by right-clicking the disk and then clicking Remove Disk). However, before you can remove the disk, you must delete all volumes (or mirrors) on the disk. You can save any mirrored volumes on the disk by removing the mirror instead of the entire volume. Deleting a volume destroys the data in the volume, so you should remove a disk only if you are absolutely certain that the disk is permanently damaged and unusable. In Disk Management, right-click the disk and then click Reactivate Disk to bring the disk back online. If the disk status remains Offline, check the cables and disk controller, and make sure that the physical disk is healthy. Correct any problems and try to reactivate the disk again. If the disk reactivation succeeds, any volumes on the disk should automatically return to the Healthy status. In Event Viewer, check the event logs for any disk-related errors such as "No good config copies". If the event logs contain this error, contact Microsoft Product Support Services. Try moving the disk to another computer. If you can get the disk to go Online on another computer, the problem is most likely due to the configuration of the computer on which the disk does not go Online. Try moving the disk to another computer that has dynamic disks. Import the disk on that computer and then move the disk back to the computer on which it would not go Online. Cause: The basic or dynamic volume cannot be started automatically, the disk is damaged, or the file system is corrupt. Unless the disk or file system can be repaired, the Failed status indicates data loss. Make sure that the underlying physical disk is turned on, plugged in, and attached to the computer. Make sure the underlying disks are online. If not, return the disks to the Online status. If this succeeds, the volume automatically restarts and returns to the Healthy status. If the dynamic disk returns to the Online status, but the dynamic volume does not return to the Healthy status, you can reactivate the volume manually. If the dynamic volume is a mirrored or RAID-5 volume with old data, bringing the underlying disk online will not automatically restart the volume. If the disks that contain current data are disconnected, bring those disks online first (to allow the data to become synchronized). Otherwise, restart the mirrored or RAID-5 volume manually, and then run the Error-checking tool or Chkdsk.exe. Cause: The Unknown status occurs when the boot sector for the volume is corrupted (possibly due to a virus) and you can no longer access data on the volume. The Unknown status also occurs when you install a new disk but do not successfully complete the wizard to create a disk signature. Solution Initialize the disk. For instructions, see Initialize New Disks. Cause: You moved some, but not all of the disks in a multi-disk volume. Data on this volume will be destroyed unless you move and import the remaining disks that contain this volume. Move all the disks that comprise the multi-disk volume to the computer. Import the disks. For instructions describing how to move and import disks, see Move Disks to Another Computer. Right-click the volume with Failed or Failed Redundancy status and then click Delete Volume. Right-click the disk and then click New Volume. Cause: Indicates that the dynamic volume is currently accessible, but I/O errors have been detected on the underlying dynamic disk. If an I/O error is detected on any part of a dynamic disk, all volumes on the disk display the Healthy (At Risk) status and a warning icon appears on the volume. When the volume status is Healthy (At Risk), an underlying disk's status is usually Online (Errors). Return the underlying disk to the Online status. Once the disk is returned to Online status, the volume should return to the Healthy status. If the Healthy (At Risk) status persists, the disk might be failing. Back up the data and replace the disk as soon as possible. Cause: Some non-Microsoft disk management products replace Microsoft Logical Disk Manager (LDM) for advanced disk management, which can disable the LDM. Solution: If you are using non-Microsoft disk management software that has disabled LDM, you must contact the vendor on the non-Microsoft disk management software for support or assistance in troubleshooting problems with the disk configuration. Cause: If a remote computer does not support the Virtual Disk Service (VDS) or if you cannot establish a connection to the remote computer because it is blocked by Windows Firewall, you may receive this error. If the remote computer supports VDS, you can configure Windows Defender Firewall to allow VDS connections. If the remote computer does not support VDS, you can use Remote Desktop Connection to connect to it and then run Disk Management directly on the remote computer. To manage disks on remote computers that do support VDS, you must configure the Windows Defender Firewall on both the local computer (on which you are running Disk Management) and the remote computer. On the local computer, configure Windows Defender Firewall to enable the Remote Volume Management Exception. The Remote Volume Management Exception includes exceptions for Vds.exe, Vdsldr.exe, and TCP port 135. Remote connections in workgroups are not supported. Both the local computer and the remote computer must be members of a domain.